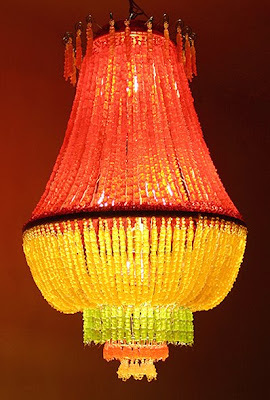 amanda mcclements & metrocurean: Snow Day Diversion: Gummy Chandelier! Snow Day Diversion: Gummy Chandelier! The real question here isn't why make a chandelier out of gummy bears (obviously because it's a stunning thing of beauty) but are those Haribos? The best gummies out there? Click here for a close-up. mmmm...Haribos...the only gummy bear for me. It's stunning!! Awesome stuff for home decoration! !